What makes gas outdoor lighting so special? 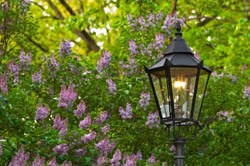 You don't have to be an expert in lighting to know that gas lighting has virtually disappeared from the extensive menu of outdoor lighting fixtures available on the market today. The main reason why this shift took place was the invention of electricity.Since then, the advancements in outdoor lighting technology has brought us much more efficient outdoor lamps. The more recent advancements in clean energy has propelled the lighting industry to introduce even more energy efficient lamps than ever before. While this race for creating the cheapest most energy efficient lighting available continues, we never take time to look at the beautiful alternatives that gas outdoor lighting gives us. Many antique outdoor lighting fixtures are modeled after these old gas outdoor lighting fixtures. The classical beauty built into these fixtures still draws people to them. If you want your outdoor lighting to stand out amongst the crowd, consider an outdoor gas lantern. Where else could you find such a beautiful fixture? Before working with gas lighting there are some safety precautions you must take. If you have young children you may want to plan ahead and make sure the gas lanterns are out of their reach. Their safety always comes first and you don't want them ever exposed to an open flame. When installing outdoor lighting always plan ahead. Always install gas light fixtures far away from anything flammable. It's best to install them on a concrete surface where there is nothing else around that could potentially catch fire. Have a fire extinguisher handy at all times. We shouldn't need to discuss this further since you should always have a fully functional fire extinguisher in your home for safety reasons. The hardest part about choosing the right outdoor lighting fixtures will be deciding between the endless styles available. Once you've gotten that covered you're 95% of the way there. Gas lanterns can be found in basically 3 types. Hanging lanterns, post mount lanterns, and wall mount lanterns. At this point you've probably figured out what each one of these lanterns does so I won't bore you with the details. Sometimes you need to take your outdoor lighting with you but a really long extension cord just won't work. Gas outdoor lighting is a portable solution to your outdoor lighting needs. Portable propane lanterns use propane gas to create light. The propane gas burns and creates a bright light as it slowly burns out the replaceable filament. Portable gas outdoor lanterns are an excellent source of light whenever electricity is not available. Take it on your next camping trip or use it for your next outdoor venue. If you do, remember to bring extra propane tanks with you so you don't run out of light too early. Gas lanterns are fully dimmable. With the turn of a knob you control the amount of gas released into the fillament, increasing or decreasing the lantern's light output. The convenience of portable gas outdoor lamps gives you the freedom that outdoor lighting provides even if an electrical outlet is nowhere to be found.